Conference on Environmental Effets on Aircraft Propulsion, Jun 1961 [AD461804]. Mr. Babington leaves government service in 1967 after serving as Program Manager for the development of the Command and Service Module, Apollo Program and launches Babington Engineering to develop products based on the unique atomization principle he invented and patented. 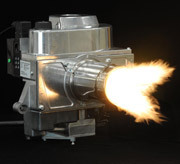 Enters into licensing deal with Rocketdyne, a major division of North American Aviation, to focus on combustion capabilities of Babington technology. Carol Babington reads article about one of the early pioneers in the treatment of Cystic Fibrosis, Dr. Paul di Sant'Agnese, and his efforts to find better methods for administering antibiotics. This leads Bob to conduct work on a medical nebulizer based on the Babington principle for liquid atomization. Worked with the U.S. Department of Agricultureto conduct mosquito-control tests in Gainesville, FL using the Babingtonprinciple. McGaw Respiratory Therapy, a division of American Hospital Supply Corporation introduces three Babington medical nebulizers all based on the Babington atomization principle – the Hydro-Sphere, Maxi-Cool and Solo-Sphere – to critical acclaim. 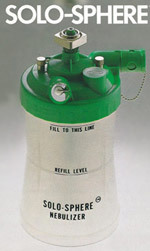 National Cystic Fibrosis Research Association and the National Institutes of Health were strong advocates of the Babington nebulizer program. John Wayne becomes first celebrity to use a Babington Solo-Sphere medical nebulizer after his heart surgery in 1977. Series of Popular Science articles published about the Babington atomization principle and burner technology. By late 80s, Saab Scania acquires and merges Bentone with Electro-Oil. Bentone Electro-Oil begins selling the Airtronic buner, but competing internal priorities leads to dissolving of partnership with Babington. The TRHS can feed up to 250 meals at a single site and at least 500 meals during a ration day; however, during expanded feeding operations, one TRHS could feed 1,500 people in one day. 1998/99 – Electrolux agrees to provide tooling for the Airtronic burner in exchange to license the technology for use in the European market. By end of 90s, the Babington Tray Ration Heater (TRH) is adopted by all branches of the U.S. Military, including the Coast Guard. The Powered Multi-fuel Burner or PMB becomes the field food service burner of choice for the Marines, Navy Special Warfare, Navy Seabees, and the U.S. Air Force as well as the Marine Corps Reserve and the Air National Guard. In 2005, Hurricane Katrina strikes New Orleans and the Gulf coast. State of Mississippi activates National Guard. Babington's Tray Ration Heating System used by the Air National Guard to feed 12,000 meals per day. In 2006, acquires FabX/Metals, a metalwork and fabrication plant located in Rocky Mount, NC, bringing 125,000 square feet (or 3 acres under roof) of fabrication, warehouse and office space. Based on its observations and lessons learned from recovery efforts after Hurricane Katrina, Babington Technology immediately begins designing what will become the Ultimate Mobile Airtronic Kitchen or UMAK. Utilizing its Airtronic burner as the clean heat source, Babington developed the Airtronic Silent Griddle, the Airtronic Convection Oven and an Airtronic Stock Pot Station. The National Oil-Heat Research Alliance (NORA) awards Babington Technology a grant to develop a high efficiency home heating unit incorporating the Airtronic burner. Today Babington has a patent portfolio approaching 150 patents, with many more patent-pending applications in the works. Many new products are in the pipeline.